Find the Order Information heading, click Orders or use the Search by PO/Order/Invoice No. fieldSelect the order you are looking for, and use the tracking number to track the package through the freight provider, or view the invoice you are looking for. The quickest way to locate a part number is to plug it into the Search field , located at the top-left of the page. How do I get certificates of calibration / conformance? Certificates of Conformance to ESDSystems.com drawings and specifications will be included at no charge if requested when an order is placed. For electronics items that are calibrated to NIST traceable standards, Certification to NIST Calibration will be included with the item at no charge. For further calibration information click here. 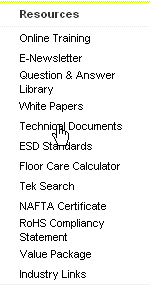 MSDS Sheets can be found on any page in the footer section of the website by navigating to Technical Information, then clicking on MSDSs. All of our Technical Bulletins, Drawings and Sheets can also be found on this page. It can be found on any page in the footer section of the website by navigating to Resources, and then clicking on NAFTA Certificate. What online training do you offer? At the moment we offer one ESD Coordinator Certification exam, accompanied by an array of training documents and materials. 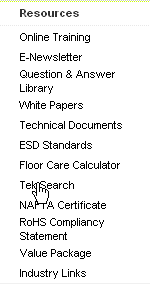 The training section can be found in our left-hand menu by navigating to Resources . Listed are the recommended documents and references, as well as two quizzesand answers. The bottom-most link brings you to the Coordinator exam. The exam is made up of modules, each with 10-40 questions. Answers are presented in a random order. Once you have finished a module, the answers are given (not necessarily lettered as you answered them). Once you complete a module you will not be able to retake it unless it is reset by us ( Send an EMail if you need to retake). Onceall modules receive a passing grade (70+) your exam will be completeand you will be able to print out a custom certificate of completion. The Floor Care Calculator is a tool used for calculating floor care costs over a period of 12 months. It can be found on any page in the footer section of our website by clicking on Resources, and then clicking on Floor Care Calculator. To use the calculator, simply check off the products you wish to use on your floor using the left check boxes. Some products offer multiple brand options. Select from the available Application Periods. Finally enter a square footage amount and click Submit . A detailed table will be produced from the items you selected. One of the best features to the calculator is the ability to deduce what quantity of each part number you will need to supply your flooring. You may click on part numbers to be brought to that part's page. How do I find the right size packaging for my components? We provide a tool that can tell you what packaging products we have in your size. It can be found in the left-hand menu by navigating to Resources . Enter your component's dimensions in inches, and choose to search corrugated handlers, plastek handlers or both. Click Submit and your results will be displayed, with the closest matches at the top of the page. All returns for calibration or credit must be approved in advance. Call or email ESD Systems.com for an RMA. A restocking fee and/or repackaging fee may apply. Training products must be returned in their unopened original packaging. Please refer to the SHIPPING AND HANDLING CHARGES section of our Terms of Purchase.